Submitted by Joe from Coolercash this article about Variance in poker – understanding heaters and coolers belongs to the Poker Strategy series. When I started playing cards 20 years ago, I was only concerned with one thing…winning. This seems like it is always the goal when you sit down and play any form of cards. I have played most forms of poker and consider myself proficient in most all of them, but now good enough to be giving much advice on. The few games I am good at, I will give advice on because I think there are always bits of information that will prove useful in any given session of poker. The one concept that had always perplexed me as I was getting a start in poker was why I would go on streak of losing and winning, where on one hand I could not seem to win a hand and the other no one had a chance of beating me. The idea of variance was lost on me and I conceded that I was either very lucky or very unlucky at any given time. Now, you will hear people talk about variance in the broadest terms and will glaze over the subject, but this is one I think we need to spend some extra time on because it comes into play with not only poker but everything we do in our lives. Have you ever been in a casino, dog track or home game and hear someone proclaim that they are most unlucky person in the world? I know I have felt the sting of defeat over and over again and never knew when the tides would shift. Sometimes the tides don’t shift for months, sometimes it is only a few days. When we go on these long streaks, we must remember our teaching. We must regress back to the simplest form of the game because this is what is going to get us through this rough spell. If we fight the tide it is only going to drag us further from shore. Now, it is nature in this current poker climate to get fancy with out play and try to bluff everyone off of every pot because we are 100% convinced that poker is a skill game and nothing more. 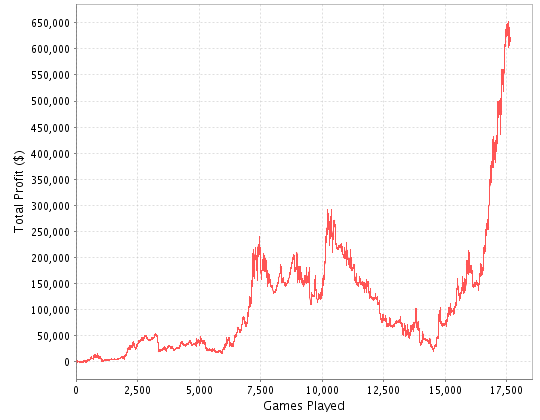 Well the truth is that poker in the short run is teemed with variance. This is something that poker players have a long time getting used to because it contradicts the “egotistical” driving force behind what makes most of us play the game. For some, money is not all the as important then winning. Now the two ideas seem to go together, but to the ego driven mind winning is more then dragging a pot…it is dragging a pot when you weren’t supposed to. We all love this feeling and it is this feeling that keeps us coming back for more. Money is always great but we must learn to control this desire to constantly outplay our opponents. Variance is a fact and it is not something we can circumvent no matter how much we try. Now, like I said variance just happens and it will happen over and over for good and bad. I like to think of the whole thing as if I had a key in my hand. The key is in itself nothing but a device to open a door. The lock consists of tumblers that will fit inside the groves of the key to make the lock turn. When we have the right key in our hand and put the key into the whole all the tumblers will fall into place and the door will open. When this happens we have streaks of good luck and we “run well”. Everything that we do seems to work and all of the planets seem to line up and everything is right with the universe. This is a good feeling and we must relish it and remember our good fortune because there will be a time when we are not holding the right key and the lock will not open no matter how hard we turn. The problem comes into play when we try to turn the key when it simply will not budge. There are nights when nothing that we do will work, when we constantly get outdrawn and none of out plays will work. This will happen because it is supposed to. The fool is the one who says in his heart that they will always find a way to win. You can sit on a table for hours on end but all you will end up doing is making a bad situation worse…i.e. ripping the key off inside the lock. When they lock is “jammed” it is impossible to put another key in. We cannot use different methods or “keys” to make the lock turn again because we are no longer thinking clearly. The last thing we must realize is that we not only have to deal with our own variance, but we have to deal with the variance of those around us. When there is someone at the table who can’t seem to lose, you need to be very careful because his streak of positive variance might act as a vacuum and turn your variance more negative then it already is. We must learn to swim with the current of the streak and never work against the tide. Let the natural variance of things work in your favor by minimizing your losses when the tide turns against you.